We have no idea yet how much it will cost, but Nissan is positive it is capable of making such vehicle ready in 7 years' time. Tired of driving? Go for autonomous drive cars. Photo by Crain News Service via TireBusiness. The Japanese automaker plans to offer commercially viable vehicles that are capable of autonomous operation without driver input. The self-driving vehicles will be sold “at realistic prices for consumers,” the company said at a media event in Irvine, California. 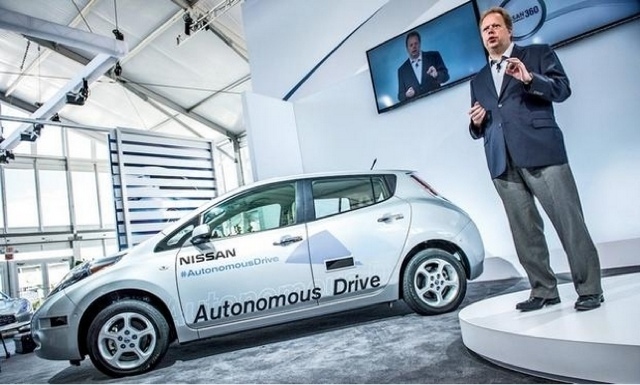 Nissan said its goal is to offer autonomous cars across the model range within two vehicle generations - about 10-12 years after the projected 2020 launch. The company said it has been researching and developing autonomous vehicles for years with such top universities as Massachusetts Institute of Technology, Stanford, Oxford, Carnegie Mellon and the University of Tokyo. It is building a dedicated test track in Japan for autonomous vehicles that will be completed by next spring. Google, the internet search leader, launched an autonomous car program in 2010 and has built and is testing several different versions, including one based on Toyota's Prius. Yes, the technology itself, but the bigger ones are legislative and regulatory. Safety regulators in various countries will have to sign off on new rules of the road before the first autonomous car can be sold. The company expect that the first models to go on sale will probably be confined to special highway lanes in selected areas. And getting to that point probably will require highway officials to invest in advanced road improvements, with new road-to-car communications capabilities and emergency provisions. TheGreenMechanics: If we live to see year 2020, we maybe able to sit in such a 'driver-less' car and travel from one place to another doing all kind of stuff but driving. Talking about productivity and efficiency. Note: I scooped this interesting piece here. You can read the complete story there. Nissan murano is what your looking for. very nice car!